Wisconsin Historical Society Press, 9780870207181, 136pp. In 1965, Wisconsin native Georgette "Dickey" Chapelle became the first female American war correspondent to be killed in action. Now, "Dickey Chapelle Under Fire" shares her remarkable story and offers readers the chance to experience Dickey's wide-ranging photography, including several photographs taken during her final patrol in Vietnam. Dickey Chapelle fought to be taken seriously as a war correspondent and broke down gender barriers for future generations of female journalists. She embedded herself with military units on front lines around the globe, including Iwo Jima and Okinawa, the Dominican Republic, and Vietnam. Dickey sometimes risked her life to tell the story--after smuggling aid to refugees fleeing Hungary, she spent almost two months in a Hungarian prison. For twenty-five years, Dickey's photographs graced the pages of "National Geographic," the "National Observer," "Life," and others. Her tenacity, courage, and compassion shine through in her work, highlighting the human impact of war while telling the bigger story beyond the battlefield. 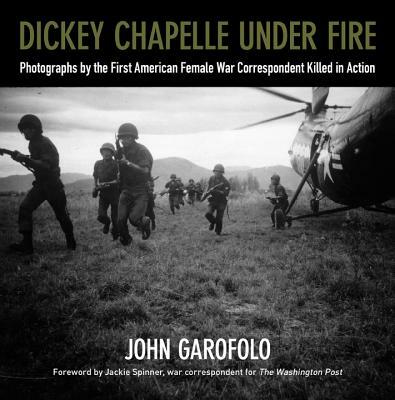 In "Dickey Chapelle Under Fire," the American public can see the world through Dickey's lens for the first time in almost fifty years, with a foreword by Jackie Spinner, former war correspondent for "The Washington Post." John Garofolo is a former entertainment industry executive and veteran of Operation Iraqi Freedom. A commander in the US Coast Guard Reserve, he has more than twenty-five years of active and reserve military service and taught at the Coast Guard Academy. Thanks to a grant from the Brico Fund through the Milwaukee Press Endowment, he has written a stage adaptation of Dickey Chapelle's life. John earned a PhD from the University of Southern California School of Cinematic Arts and lives with his wife and daughter in Southern California.